Your brand is more than just a logo. It’s your personality, your tone of voice, and your attitude. It is the visual representation of your own unique company culture. A well-crafted brand appeals to your target audience and forms a deeper connection with the people you want to do business with. Before we even begin experimenting with ideas, we put in the research. We’ll take a look at your competitors to make sure that we approach your brand in a way that fits your business, but sets you apart. Then, we’ll get to know your target audience and what makes them respond to the leading brands so that we can put those principles to work for you. Once we’ve discovered how to approach your brand, we will start creating logo concepts. We’ll work with you to narrow down ideas until we arrive at something that represents your business perfectly. And because you’re going to use a variety of media in your marketing efforts, we create a full package of logo assets that will make your new brand coherent and super-versatile. Creating a great brand is a lot of hard work, but the job is never really done. It’s an ongoing process to cultivate your brand identity, keep your materials consistent, and align your message with the needs of your audience. Brand management services ensure that every aspect of your marketing efforts fit the mold of that message and live up to your brand’s high standards. We don’t leave anything out! We want your brand to be represented on ALL platforms + media, so we make sure to provide you with everything you need to make that happen! You’ll always have just the right files you need to display your brand wherever you go. YEP! They’re ALL there. Need more than this? No problem! Just let us know before we get started. Full color, reversed full color, black, white, grayscale, 1 color versions in your brand colors + Watermark for ALL logo styles. Keeping your brand consistent requires more than a logo. We will pick out matching fonts for your brand to keep your brand consistent & well-represented beautifully on any platform! To ensure your brand stays consistent, and your logo is produced correctly, we create a guideline + usage sheet so that you, and your vendors, keep your brand on track. You're ready to start taking the first steps in establishing, or refining, your brand to better reach your customers. We'll do the research, strategize the best direction for your brand, and create a logo that will help you standout. Building your brand means being consistent. By expanding your brand to all aspects of your business, you start creating that connection between you and your audience so that you can convert more leads & sell more. After you've established your brand, it's time to keep it consistent. Bring in the experts to help you manage your brand across platforms. Building a business takes a lot of work, and you know that if you don't tell your audience who you are - then they will decide for you. 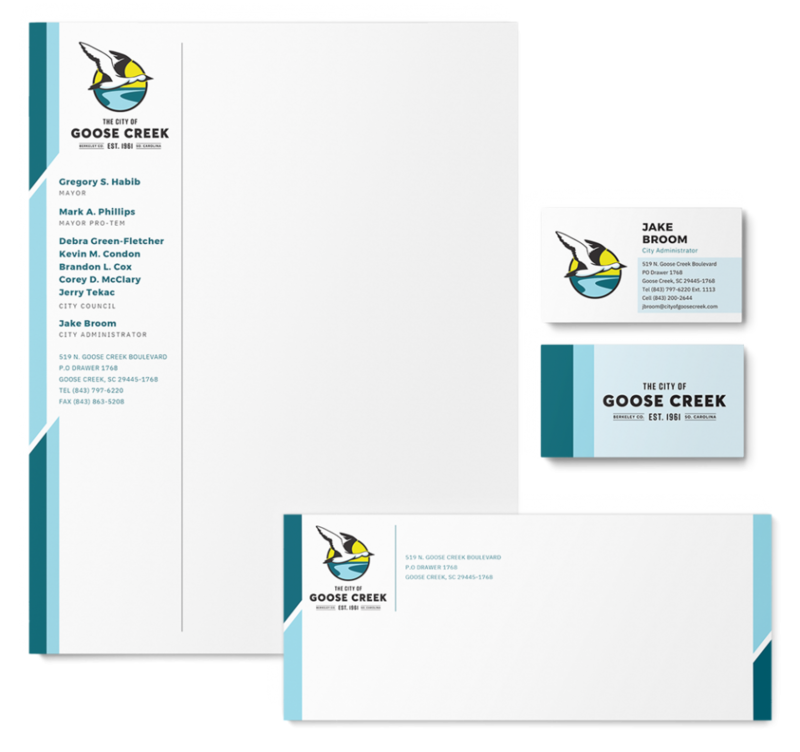 We’ll put your new branding to use on a snazzy business card that will set you apart from everyone else. You’ll be ready to hand them out everywhere. Postcards, Envelopes, Stationery... you name it, we can tailor it to your brand. The possibilities are endless! When it comes to marketing new products, the packaging is just as important as what's inside. We have the experience and creativity to make a great first impression. We create custom social media templates that will turn heads and get you the engagement you need - all while keeping your brand cohesive. A website allows customers from all over the world to virtually "walk into" your business. We make sure your site is optimized to work for you. What is included in a logo package? Everything listed above! We walk you through the steps of discovering your brand, stylizing guides to help keep you on track after the project, and custom logo design, and a full well-rounded package of all the logo files you will need for digital, print, or web! I need a different package than listed above. Can I have something custom? Of course! The packages above are our most frequently combined items. However, we know that all business needs are not the same. Contact us and let us know what things you need, or we can figure those out together! I have no idea where to begin. How can you help? That's totally ok! In fact, we have put together a free brand guide + workbook created just for those who need some guidance on getting started in establishing their brand. We'll guide you through the process and provide our experience to help guide your brand to build your business + drive more revenue. What types of collateral items can I use in the Brand Package? We want to provide you with something that compliments your business + aids towards your business goals. That can look different for all businesses. Here are some of the most popular options: postcards, thank you cards, envelopes + stationery, flyer, social media ads, and lead magnets! How long does a logo design project take? The typical turnaround for a logo project can vary, but 10-12 business days is usually average. It is important to have timely feedback in order for this process to go quickly, so let us know ahead of time if you will be unavailable. If you are working with a team for approval, it will usually take a lot longer than (1) person - as many people involved = many opinions. Try to keep your team meetings organized, and the business goals focused to keep the process running quickly. We offer "reasonably unlimited" revisions on our logo and branding packages. We want you to be completely satisfied with your design, so we try to give you more than enough rounds of revisions to make this happen. We cap our revisions off at 12. With our process, it is rare that we ever make it this far, and if we do, then our next step is to start over at re-evaluating the overall direction + brand for your business. Again, our ultimate goal is to build a brand that you are satisfied with & ultimately grows your business. I'm ready to get started. What's the next steps? Awesome! We're excited to talk with you and help you start strategizing to grow your business. First, start by clicking the contact link or any of the buttons on this page to fill out a form to contact us + get the process started to help us get to know your business. Be prepared to give us some basics so we can understand your business needs. Then, we'll get in touch! You'll receive some informational documents that outlines the process and what you can expect. Have any questions? Don't hesitate to ask!